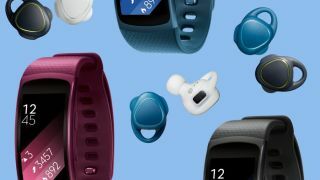 Samsung watchers have spotted a newly registered trademark for a Gear Fit Pro, strongly suggesting that the company is planning to add to its range of wearable health and fitness trackers in the not-too-distant future. Samsung's most recent effort in the market was last year's Gear Fit 2: apparently it's now got bored with the numerical naming system and wants to kick things up a notch with something a bit more professional. Unfortunately the name is just about all we know about the device at this point. The trademark application, which was filed with the European Agency For Intellectual Property, doesn't include any illustrations or details of the specs of the Gear Fit Pro. The fitness wearable market has been a tough one for hardware makers to crack up until this point, with anyone other than Apple and Fitbit struggling to shift devices in significant numbers, and users not upgrading their devices all that regularly. This trademark application would suggest Samsung isn't giving up though, and there have also been rumors this month that its S Health app is in line for a major update too. Real-time health monitoring has been one of the features tipped for the upcoming Galaxy S8 flagship smartphone. That phone is tipped to arrive in March and it just might arrive alongside a Gear Fit Pro as well. If Samsung wants to reveal the wearable at a major expo, it could choose Mobile World Congress at the end of February, or IFA at the start of September.